Getting pregnant as a teenager and being coerced into giving her baby up for adoption left a festering scar on Jaymee Ballard’s life. Trapped by poverty and without many allies, Jaymee nearly gives up hope of getting her daughter back after her best friend is murdered. Now, four years later, a wealthy woman with legal connections hires her as a housekeeper, and Jaymee gathers the courage to seek her help. But Jaymee’s last chance ends up in a puddle of blood in one of the historic antebellum mansions in Roselea, Mississippi. I just murdered your wife...again. An unsigned letter consisting of six horrifying words turns Nick Samuels stagnant life upside down. Stuck in emotional purgatory since his wife’s unsolved murder four years ago, Nick is about to self-destruct. The arrival of the letter claiming credit for his wife’s murder and boasting of a new kill sends Nick to Roselea, where he and Jaymee’s worlds collide. Jaymee and Nick realize exposing the truth about her daughter’s adoption is the only way to solve the murders. Up against years of deception, they rush to identify the killer before the evidence–and Jaymee’s daughter–are lost. But the truth doesn’t always set the guilt-ridden free. Sometimes, it destroys them. The tale begins when we meet Jaymee Ballard a struggling waitress whose back history is enough to make you shudder. At seventeen she was forced to give up her newborn and with the help of a friend she had hopes of finding her daughter. It’s been four years since her friend’s murder and the noose of poverty is making it harder to fulfill her deepest desire. All of that changes when the wealthy woman she cleans house for is discovered murdered and her best friend’s husband returns bearing a note that says, “I just murdered your wife…again.” Nick Samuels failed his wife years ago and is determined to solve this case. A discovery that Jaymee’s daughter is somehow connected leads the two to work together and the tale that unfolds is riveting, filled with twists and turns that kept me on edge. The characters in Green’s novel are fleshed-out, tormented and genuine. From the sinister to the sweet, Green fleshed them out bringing this town and its secrets to light. Jaymee is angry, frustrated and so courageous. She is also stubborn, independent and proud. I loved watching this emotional, head-strong woman makes steps to trust, and confront her past. Nick is a well-known investigative newspaper reporter but since his wife’s death he has just been stuck in a rut as he obsesses over everything he did and didn’t do in his marriage. The fact that her killer still roams free torments him. I liked the interaction between Nick and Jaymee, without trying to they help each other confront the past and deal with their own emotional baggage as they hunt down answers. A romance develops slowly and felt genuine as it held the promise of healing, hope and love. The suspects in the case, all affluent members of this society’s small-town gave us a glimpse into its dark secrets. There are giant pink elephants wandering the streets but townsfolk ignore them. We often see this dynamic in small town politics and Green captured it beautifully. Stacy Green weaved a fantastic suspense thriller that felt plausible and made me shiver. Her descriptions from the homes to the oppressive heat in the small town of Roselea were captivating and so fleshed out that I could taste the humidity and smell the river. From the beginning she gave us a strong sense of the town’s mentality and deeply religious convictions. The more we learn about Jaymee and her baby the darker the tale becomes. Green wove all of the murders together with a common thread and I found it riveting as Nick and Jaymee unraveled clues and got closer to the truth. The tale gradually picked up intensity as the pieces clicked together. The facts and events had an air of believability about them and could have been ripped from today's headlines. Green added some twists that even I didn’t see coming, and anymore that is hard to do. The tale wrapped up nicely and I was delighted to hear there is a second book that deals with one of the secondary characters. 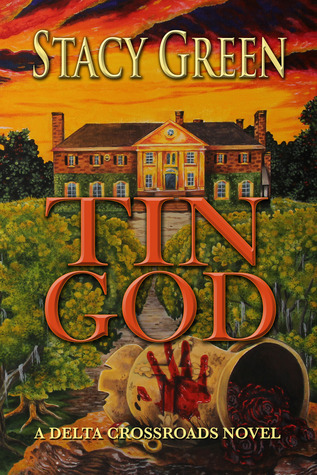 Fans of mysteries, thrillers and romantic suspense will find Tin God captivating. Green writes like a seasoned author, and could hold her own against some of the big thriller authors whom I love. I absolutely cannot wait to read the next book in this series.